Byzantine art is the art of the Byzantine Empire. Byzantine art was completely focused on the needs of the Orthodox Church, in the painting of icons and the decoration of churches with frescoes and mosaics. Byzantine Iconography – is the oldest and only Christian art form survived unchanged for the past 2000 years.The term ‘icon’ – icona, comes from the Greek word eikona (εικων,eikon, ) which simply means image. Byzantine icons are filled with symbolism designed to convey information about the person or event depicted. For this reason, icons tend to be formulaic, following a prescribed methodology for how a particular person should be depicted, including hair style, body position, clothing, and background details. Iconography classes start at 10.30 am till 13.30 Mornings are spent with your tutor in a more formal teaching situation .The afternoon program me is designed to be flexible. You can carry on painting, with your tutor on hand to help and consult. Alternatively you may just want to relax by the pool, explore or go for swimming to nearby beaches. 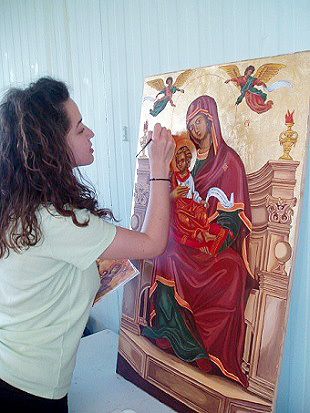 The aim is to create icons with the traditional byzantine methods. We create by hand using traditional techniques of egg tempera, powder pigments of highest quality .We will create a theme using a traditional depiction. As a group we visit the Antivouniotissa Monument-Church-Museum in the historic center of Corfu. An Orthodox church of the 15th century dedicated to Virgin Mary Antivouniotissa , has been turned into a Museum that houses the religious expression of the Byzantine tradition , combined with the influence from the west. * Other dates on request. Sometimes if there are several requests we will set an additional workshop. We will inform you regarding that if you leave us your email address.